The Berserker Dwarf of Fire Canyon #1 and #2 (Russian Alternative) | Azazel's Bitz Box. 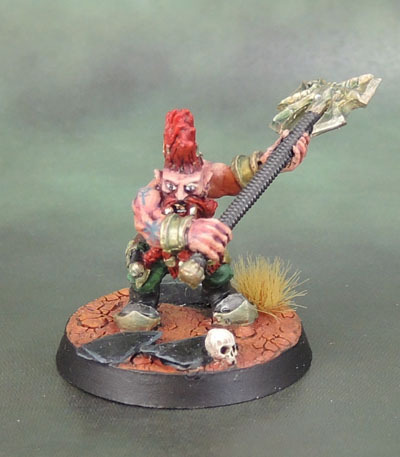 Back in April, I reviewed a pair of Russian Alternative’s Fire Canyon Berserker Dwarfs – essentially Chaos Dwarf Slayers. At the time I was very happy with the sculpts and their quality. Recently, I managed to finish off painting that pair, and so I present them to you today. The palette I’ve chosen to use is influenced both by previous Chaos Dwarfs – as I’ll explain – and also GW’s Dwarf Slayers with a few tweaks, as I want them to be immediately recognisable as a mutation of the Slayer Cult, while also being distinct in their own right. So I’ve gone for deep red hair and beards rather than orangey-ginger. The tattoos on these Berserkers are in a different, angular style rather than the rounded, Maori/Tribal/Celtic style of my Slayers, and the colour used is a deep turquoise/sea green (Vallejo Panzer Colours “Periscopes”) rather than the deep blues used on the Slayers. Similarly, both the Berserkers’ weapons and their bling are done in a cold brass, shaded with a hint of green rather than the warmer tones I use on the Slayers. 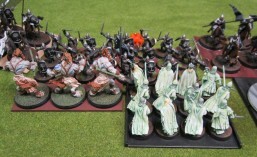 The green is carried across to their pants, as I decided that going for stripey trousers was just too close, and too jaunty for Chaos Dwarfs. I could have gone for other patterns, triangles or whatnot, but again – I decided against it on these guys. Simple, grim and functional. 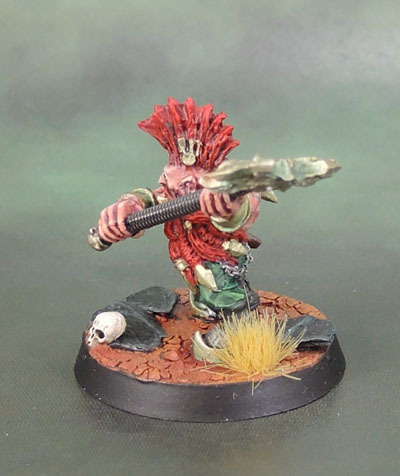 While the Chaos Dwarfs of the past few decades have had very much an “official” scheme of Red, Black and Brass, I have a strong and influential memory of a Model from the old Chaos Dwarf Renegades box, released in 1986, that has stuck with me. Specifically Khazek Doomlord, in his deep green armour. I can’t locate the decent-quality ‘eavy Metal White Dwarf pic right now, and the SoL image is unfortunately poor quality, but Qiao Zhong’s modern interpretation of the original scheme shows the overall “feel” pretty well. 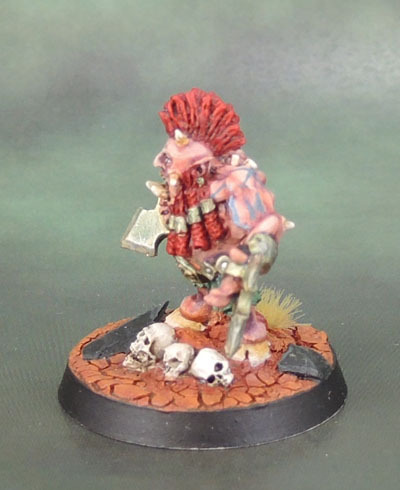 The original really has stuck with me through all these years, and was echoed in my Chaos Ogre that I painted a couple of years ago (link to be inserted after I fix those posts), and the vision I have for my Chaos Dwarf army is one that will incorporate both the red/black/brass of modern Chaos Dwarfs and the red/green/brass typified by Khazek. 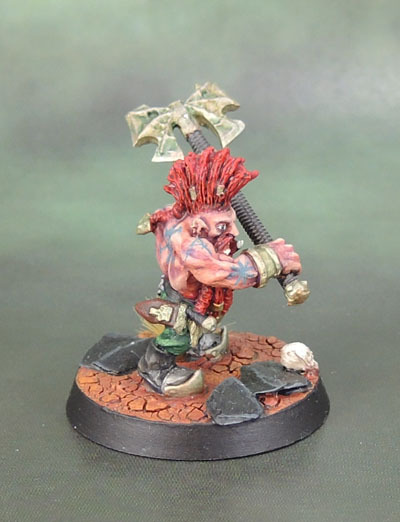 The second of the two Berserker Dwarfs of Fire Canyon is painted in pretty much the same scheme as his fellow. 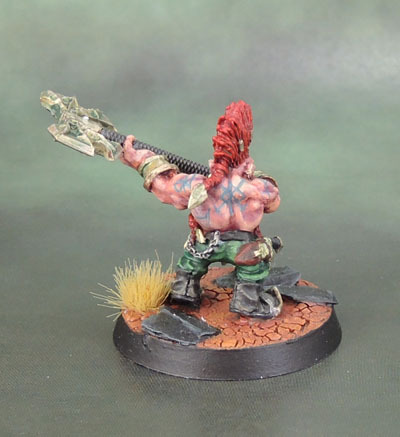 With his more “open” back, there was space to go a little further with his tattoos, which, as with his fellow, are a mixture of the various dwarven runes conveniently compiled over at Chaos Dwarf Online. Basing was done with GW’s “Martian” basing paints, and slate painted dark grey/black to represent obsidian. I felt that the parched grass was needed to add a little bit of additional contrast in texture. The skulls on both figures provide interest, and also direction when they get used as champions in our games of Gorechosen. L-R: Warhammer Quest Slayer, Daemonslayer, Fire Canyon #2, Skull Pass Warrior, Fire Canyon #1, Giant Slayer. To finish up, a scale shot comparing them to some of the most appropriate and one of the most common figures from the Dwarf range. Unfortunately, I only have one other Chaos Dwarf painted, and he’s one that dates from that Renegades boxed set, so he’s useless for modern scale pics. I’ve been slowly working on this pair alongside my regular dwarf Slayers, as it seemed the easiest way to do it. 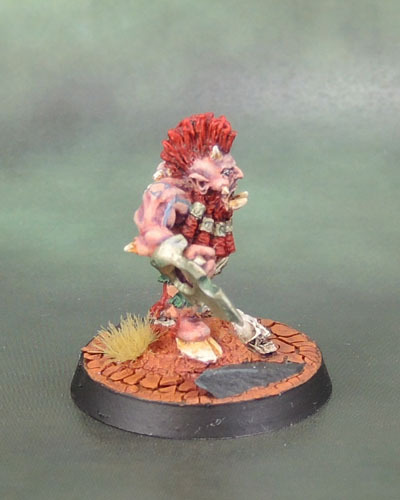 Unfortunately, I appear to have misplaced the box with the unit of regular Bersekers – as well as their awesome looking trolls, both of which I intended to review and then paint next. D’oh! Edit – Found ’em! WOOT! 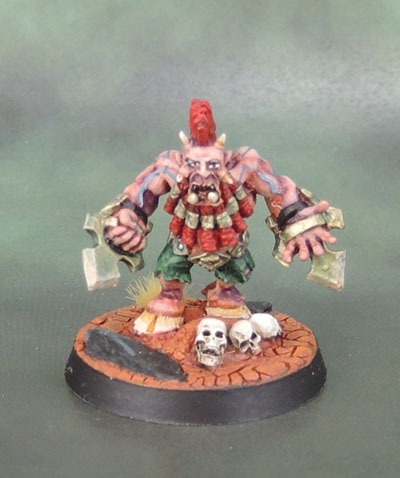 This entry was posted in Age of Sigmar, Chaos Dwarf Army, Warhammer Fantasy - 9th Age and tagged Berserker Dwarf, Berserker of Fire Canyon, Chaos Dwarf, Dwarf of Fire Canyon, Russian Alternative. Bookmark the permalink. Nice work. The bases look good and evoke the feeling of the plains around Zharr-Naggrund, or how I imagine them anyway. 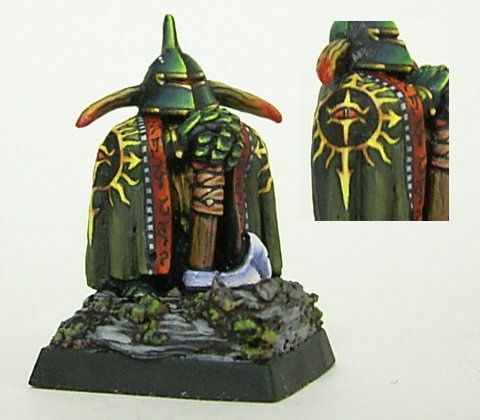 Chaos dwarfs are very cool but they are one army I have never come across in person. A shame! Thanks, I wanted to evoke a blasted landscape, but it needed the tufts to fully finish it, and not just look like they’re walking on Mars. They’re rare, all right. Not having been supported for so many years, it’s a surprise you see this many of them online even! Brilliant mate, they are amazing little characters – good call on the green and the deeper red for the hair! Thanks Alex. I tried to make them similar, but tweaked. I forgot to mention the different skin tone I used for them, which you can see in the group/scale shot up there. At first I thought the tattoos are bulging blue veins, but on close examination they work well as tattoos. I like the red soil basing. Adds a bit of background information and is a simple way to add interest. Overall the paintjobs are excellent as always. 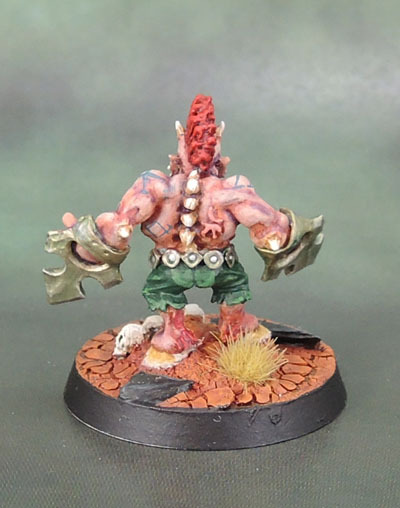 There’s a bit of both – the first model has bulging veins distinctly sculpted on his biceps, so I had to recognise that with paint, so his veins are blueish, while the tattoos on both models are greenish (dark turquoise). They might be a bit faint on these two, but I’m okay with the faded look as well. Cheers! Skipping leg day…may Brodin have mercy on their souls.